AERIAL-LIFT PLATFORMS - No hydraulic training necessary! "A quality control manager was using an aerial platform to collect material samples. He raised himself approximately 30 feet into the air to obtain the sample. As he began to lower the platform a failure occurred. The platform fell approximately 27 feet. The victim was ejected from the platform, and landed on the asphalt below. He suffered fatal injuries." An investigation into the cause of the accident determined that the machine was not properly maintained! 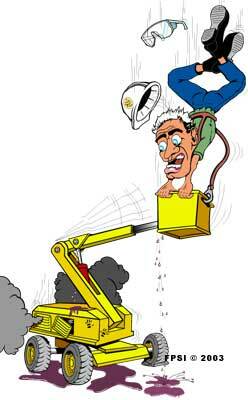 "Do it, or hit the road!," is what a diesel mechanic was told by his supervisor when he explained to him that he was not adequately trained in hydraulics to perform repairs to the hydraulic systems on the companys fleet of rental mobile aerial-lift equipment. He was deeply concerned that due to his limited knowledge of hydraulics he might do something to a hydraulic system that could cause it to fail, and in turn, seriously jeopardize the operators safety. The company, one of the largest rental companies in the western U.S., apparently knew, when they hired him to maintain their fleet of rental equipment, that he had no previous training in hydraulics. Yet, they went ahead and signed him on promising to send him to the numerous factory schools offered by the various manufacturers of the equipment they owned. However, all the requests for training that he tendered were promptly declined citing poor timing, and staff shortages - they were simply too busy making money to have him absent from the workshop for a few days! They also used the other industry wide excuse - no money! On one occasion he was asked to find out why the mast on an aerial-lift was drifting down. Through trial and error, he determined that the problem was a defective load holding/safety valve - it apparently needed to be replaced. The machine manufacturer did not have the valve in their inventory, and advised him that it would take at least two weeks before it would be available. He reported the situation to his supervisor who apparently balked at the idea of having the machine unavailable for rental for two weeks, and ordered him to piece it back together so it could be rented until the replacement part arrived. The mechanic knew that the machine was defective, and was clearly unsafe to use. Not only was the mast drifting, but he had disassembled and reassembled a safety valve that he knew nothing about. He urged his supervisor to reconsider his decision to make the machine available for rental. However, his plea fell on deaf ears. In fact, the supervisor became agitated and told him to "stop whining." Knowing that what he had done might cause the hydraulic system to fail and seriously jeopardize the operators safety, he hand wrote a "waiver of liability" and handed it to his supervisor to sign, hoping that he might reconsider renting the defective machine out - but to no avail. Surprised? Dont be! Less than 5% of the people who service, repair, and troubleshoot the hydraulic systems on aerial-lift platforms - the machines that elevate electricians, painters, sign-makers, construction workers, aircraft mechanics, etc., in the air, are proficient in hydraulics, the very systems that propel the platforms 40-feet, to over 100-ft in the air - the majority cannot even read a hydraulic schematic! It is astounding why many mechanics and technicians do not get proper training - here are just a few of the more common reasons: the training budget is tied to the supervisor's bonus program; there is a personality conflict between the supervisor and the mechanic; the company won't train, because if they do the mechanic will leave for a higher paying job; the supervisor is concerned that the mechanic will be more knowledgeable than him/her; and the list goes on! Fortunately for all of us, the airline industry operates within the parameters of defined standards, along with rigid checks and balances. Aircraft mechanics have to be certified by FAA mandate, and selfish executives, managers and supervisors cant "buck the system," because the FAA is looking over their shoulders, and moreover, holds them personally accountable for the flying publics safety. What renters of these pieces of equipment have to understand is the fact that hydraulic aerial-lift platforms might very well be unsafe. Unlike the airline industry there are absolutely no standards and no rules with respect to who can and cannot service and repair this type of equipment. To gain access to the cylinder the platform needed to be raised one or two feet off the ground. For safety, he made a support out of a number of 2X4s which he stacked on top of one another. He lowered the platform on to the makeshift support, and proceeded to remove the cylinder. After he installed the new cylinder and tightened the hoses, he decided to remove the supports so he could test the machine. He reached in between the metal beams, and "punched" the stack of 2X4s out. The platform assembly collapsed crushing both his arms." 1. The victim was not properly trained to work on the hydraulic scissors-lift. In fact, he had no idea that hydraulic fluid supported the platform. 2. The victims supervisor assumed that because he was a mechanic he knew how to service and repair hydraulic systems and components. 3. The "homemade" support for the platform was inadequate. However, in the case of this machine, the boom-swing movement relative to valve activation was totally unpredictable - it would sometimes operate smoothly, and other times, would unexpectedly lunge out of control. The personnel who used the machine, reportedly complained about the problems with the boom-swing mechanism. The company in turn, filed a complaint with the manufacturer. The manufacturer sent their technical representative to investigate the problem. After conducting a series of tests, the technical representative concluded that there was nothing wrong with the machine, and subsequently gave it a thumbs-up! The utility companys safety department bought off on the manufacturers inability to correct the problem, and put the machine into service. The electrician who was "flying" the machine at the time of the accident also bought into the situation, because it was a well-known fact amongst employees that this particular basket-lift had a boom-swing control problem. The fact that he was "flying" it meant that he was willing to risk his life at the expense of a defective machine. The victim was working on a 24,000-volt overhead power line. Apparently there is a "2-feet rule" when working adjacent to high voltage lines. He was high above a roadway maneuvering the basket into position. He needed to make a slight horizontal adjustment so he activated the valve. Unfortunately, when he most needed to "feather" the boom-swing, it lunged unexpectedly crashing the basket into the high voltage lines. According to the flag person who was directing traffic down below, he heard an arc, and looked up toward the basket. 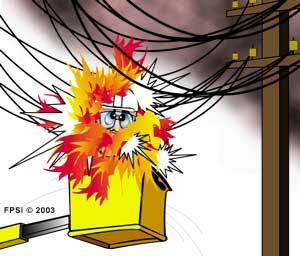 The electrician was engulfed in a ball of fire. He promptly called on his two-way radio for an ambulance." 1. The manufacturer failed to properly diagnose the problem. 2. The manufacturer failed to repair the problem. 3. The company failed to follow up with the manufacturer and insist on a permanent repair for the machine. 4. The companys safety department failed to follow up on reports about the problem with the machine. 5. The operators failed to demand that the machine be properly repaired. After installing the new pump, he started the machine, and promptly blew the new pump apart. He returned once again to his company to pick up another pump, which, yes, he once again blew apart on start-up! The first field service mechanic had absolutely no hydraulic troubleshooting experience. He apparently tried to solve an actuator "slow-down" problem by overriding the main pressure relief valve setting by placing washers on top of the spring. He associated a speed problem with a pressure deficiency." 1. The victim was not properly trained to service, repair, and troubleshoot hydraulic systems. 2. The victims supervisor assumed that because he was a diesel mechanic he knew how to service and repair hydraulic systems and components. Its evident that no one wants to take ownership of aerial-lift training. The various manufacturers of these machines offer training, but it is generally of such poor quality that it is for all intents and purposes ineffective. Even if the manufacturers schools were excellent, you have the problem of convincing the owners of aerial-lifting equipment the value of training. Most see training as nothing more than a "burden" on their respective maintenance budgets. One aerial-lift manufacturer in particular "certifies" people who graduate from their service training schools. Upon successful completion of a course (there are no failures) a person receives a card stating that the graduate is fully licensed to service and repair the entire machine - including the hydraulic system. This type of "certification" is nothing less than a token. 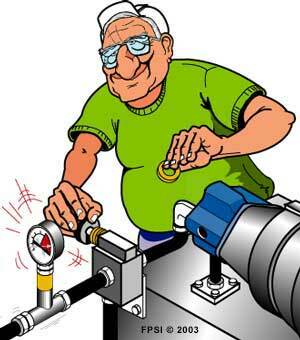 A person can receive "certification" after completing as few as 3-hours of hydraulics instruction - this with absolutely no previous experience in hydraulics! The FPSI recently had a "certified" aerial-lift technician undergo a battery of tests in hydraulic theory and troubleshooting - he rated equal to a person with no previous hydraulics experience! Mechanics are not to blame for the problem. Many of the mechanics that we come into contact with have a lust to learn and improve their skills. They simply work in an industry that has failed them! The fluid power industry's problems can be found in its roots. The founders of the various fluid power associations failed to take into consideration the safety and well-being of the people who work on and around hydraulics when they composed their various mission statements. And so was born an industry in which people work every day with absolutely no knowledge of the hazards that can strike them at any moment. The most desirable characteristic of a supervisor or manager is his/her concern for the safety of every subordinate under his/her command. Making certain that people are properly trained to do their jobs safely MUST be a supervisor's highest priority. If a person is injured or killed while performing work that he/she is unfamiliar with, the supervisor or manager MUST be held accountable. Why is this so different to allowing a 16-year old, with no driving experience, to drive a vehicle on the road? Given the facts in this Breaking News bulletin, what can you do to assure that the aerial-lift platform that you own or rent is safe to operate? 1. When you decide to purchase or rent an aerial-lift platform, make a thorough investigation into the qualifications of the people at the local dealership. Find out if they are formally trained in hydraulics, and determine how many hours of training they have received. Its no use purchasing a machine to learn afterwards that the people who service and repair aren't qualified to maintain it. 2. Only allow trained, authorized personnel to service and repair your machine. Have your purchasing department request copies of "certification" when ordering a repair or service. If the person has only on-the-job-training, dont let them touch it! In addition, youre probably paying at least $50-$60 per hour for the service persons time, why pay that much for someone who is untrained? 3. When a dealer or factory service person is working on your machine, make sure that they are wearing appropriate safety gear. Many dont even have the common etiquette to follow your company's safety rules and procedures, let alone any of their own. 4. If the dealer's service personnel are troubleshooting your aerial-lift's hydraulic system, make sure that they have the proper diagnostic tools and know how to use them. They should have suitable flow meters, pressure gauges, etc. If you see them "testing" a hydraulic pump by exhausting oil directly to atmosphere, or into a bucket, or "testing" a cylinder by removing a transmission line and running the machine, give them their walking papers immediately. Not only are they endangering themselves and those around them, but they are also teaching your maintenance people extremely poor habits! 5. Never allow anyone to make parts substitutions without written permission from the manufacturer (NOT THE DEALER). This includes filters. Many people make filter substitutions based on cost. Filters are living proof that you get exactly what you pay for! 6. 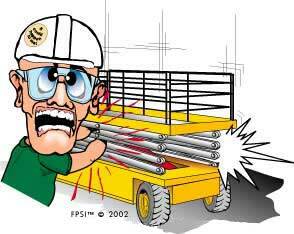 Never allow anyone who is not properly trained in hydraulics to make adjustments to your machine. 7. Maintain the machine in perfect working condition. If there are any operational problems such as erratic cylinder operation, or overheating, red-tag the machine and lock it out until the problem is rectified. 8. Never operate a machine knowing that there is a problem with it, or it is defective. A persons life is literally riding on the decisions you make. 9. Always ask for written test worksheets. If a dealer technician tests a hydraulic component(s), ask them for a copy of the test data sheet(s). 10. Inspect the work. Make sure the machine is working perfectly. Do not sign the service report until it is. 11. If you rent a machine inspect it when it arrives on site. Visually check for signs of damage, frayed hoses, leaking cylinder glands, leaking hydraulic components, correct oil levels, erratic operation, etc. If it is not operating perfectly, send it back! 12. If you have reason to call a service person to attend to the machine while you are renting it, ask that the person bring along a certificate of training. 13. Make sure that the rental company knows that you will hold them accountable for all non-injury and injury accidents. 14. If there is an accident with the machine, DO NOT let the rental company remove it from your job site. Conduct your own investigation first. First, peoples safety is the sole reason why the FPSI exists. We do not want to see innocent bystanders get hurt because of profit-minded supervisors and managers who have little or no respect for the safety of individuals and their families. Hard-working mechanics invariably get blamed when things go wrong. Many, although they are highly qualified in a given field such as diesel engines, or transmissions, never have the opportunity to advance their skills - once again, generally because of profit-minded supervisors and managers. Furthermore, we want the people who own and operate, or rent hydraulic aerial-lift platforms to be aware of the fact that there is a serious problem with respect to the skill level of many of the people who service, repair, and troubleshoot these machines. Moreover, you can do something about it. Demand that the people who sell, and rent these machines, train their technicians properly, if for no other reason than to provide a safe working environment for the people who operate them, and for the people who work around them. While we have pulled no punches with respect to the problems associated with aerial-lifting equipment, we respect the fact that there are many managers who are conscientious and caring about the fitness of their equipment, and the safety of their people - however, they are few and far between. As always, we at the FPSI are standing by to help anyone who has a genuine interest in the safety of people, and respect for their families.